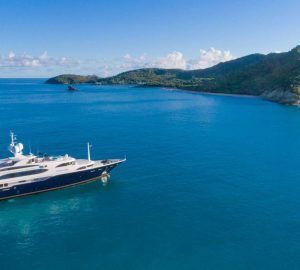 This 60m/198ft TRI-DECK SUPERYACHT was built in 2012 by Trinity Yachts and last refitted in 2017. She was constructed from a semi-displacement aluminium hull and superstructure and has naval architecture by Trinity Yachts. The exteriors are the work of Geoff Van Aller and the interior styling was done by Yacht Next in collaboration with the owner. 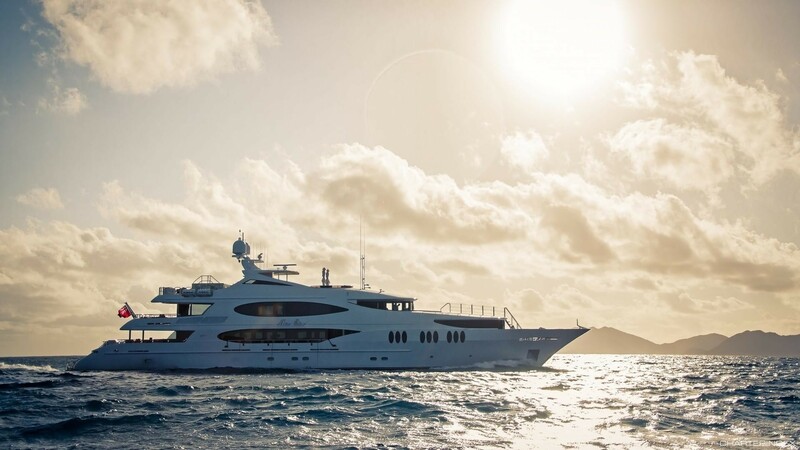 The vessel sleeps up to 12 charter guests over seven en-suite cabins and her crew of 15 offers exceptional high-quality service during the entire charter vacation. The tender garage door opens up to create a swim platform hovering above the water. 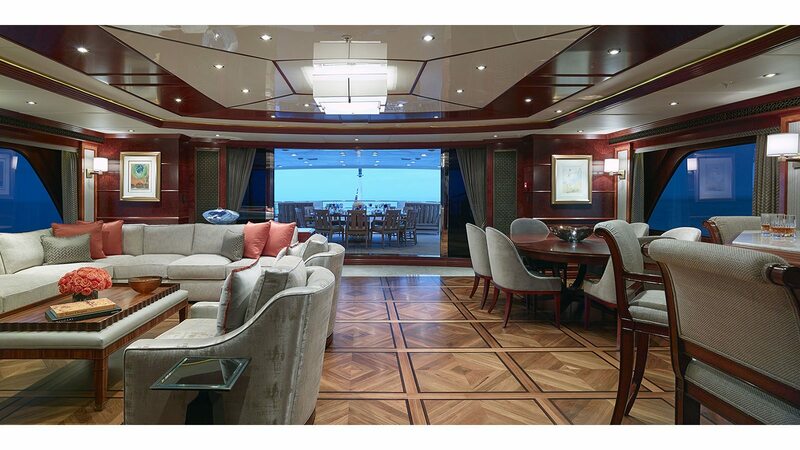 Stairs lead up to the main deck aft, which has an elongated sunpad along the stern and a plush modern outdoor salon where all 12 guests can enjoy morning coffee together. 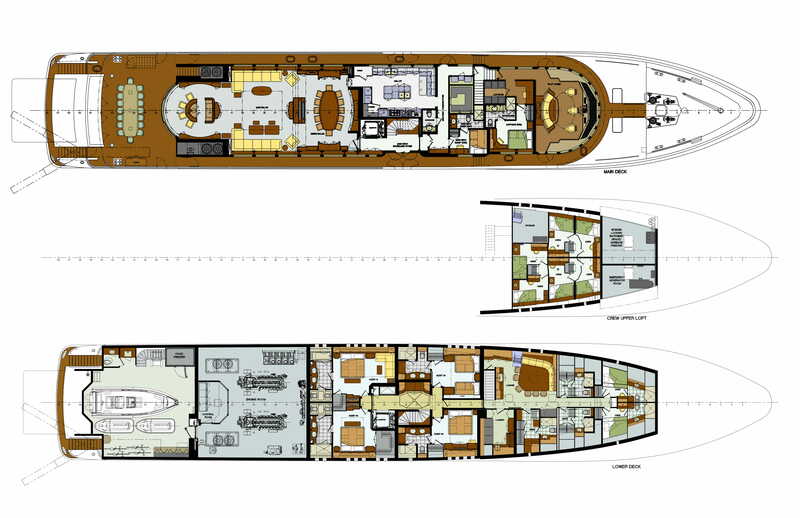 The upper deck aft has a circular dining table to seat 12 under the shade of the sundeck, overhang and after a three-course meal, the group can spread out into the two separate stern lounges for close conversation. The Portuguese deck on the bow is a private terrace attached to the Master suite that provides a sumptuous sunpad with uninterrupted forward views. On the sundeck, the stern is laid out with numerous sun loungers and a sun-exposed lounge area, while under a canvas shade is the largest alfresco dining table on board. The sundeck forward has a bar attached to the generous port Jacuzzi as well as the forward sunpads for a lavish afternoon of indulgence in the sun. 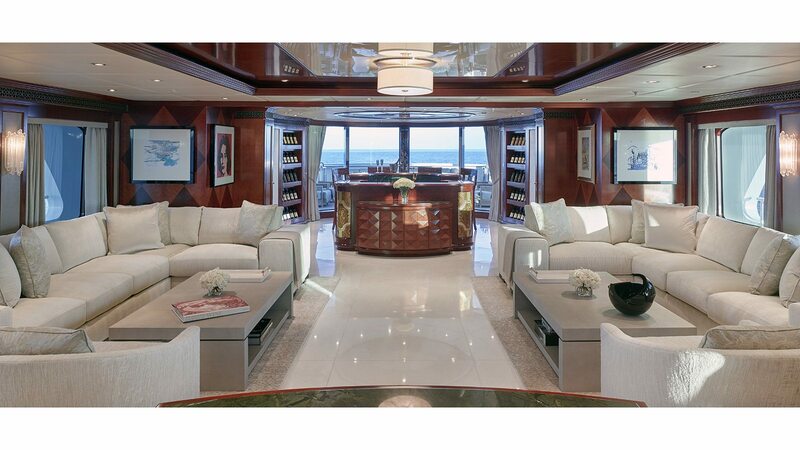 The lower deck contains the tender garage and a day head for guests to use while sunbathing on the swim platform. A staircase leads up to the main deck aft, while forward of the tender garage is the engine room and the guests' accommodation, consisting of three double cabins and a cabin with a double and single bed with a Pullman berth. The forward area is reserved for the crew quarters, galley and laundry. 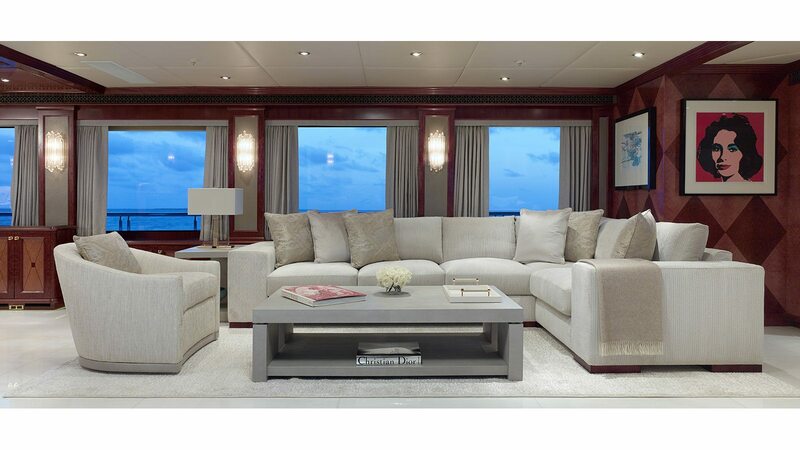 The main deck layout places the helm station forward and the captain's cabin and galley behind. The main foyer, which has a lift/elevator to connect all floors, opens up into the formal dining area and main salon. 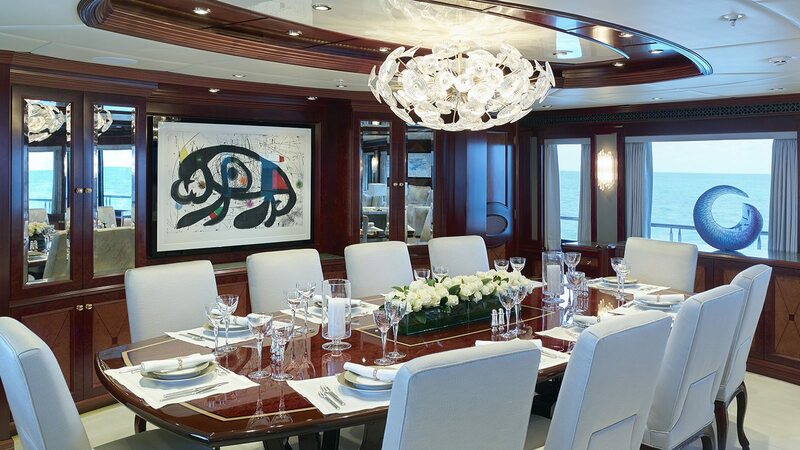 The forward formal dining area provides a grand rectangular table to seat up to 10 guests in classic surroundings with a touch of modernism in the artwork and light fixtures. To the aft, sofas, armchairs and coffee tables are placed beside the port and starboard windows to benefit from the most natural light, while the nearby grand piano will provide live music for any special occasion. Before the aft sliding doors is a second foyer area that is fitted with a grand bar and extensive wine racks for large dockside gatherings. The bridge deck forward hosts the full-beam Master suite which benefits from excellent 180 forward views and two large en-suite bathrooms behind, one containing a tub. Stairs and a lift (elevator) are located along the starboard side of the corridor, which passes a port-side VIP stateroom with large wardrobe, en-suite bathroom and desk, while the starboard-side has the Master office which can be converted into an additional double guest cabin. 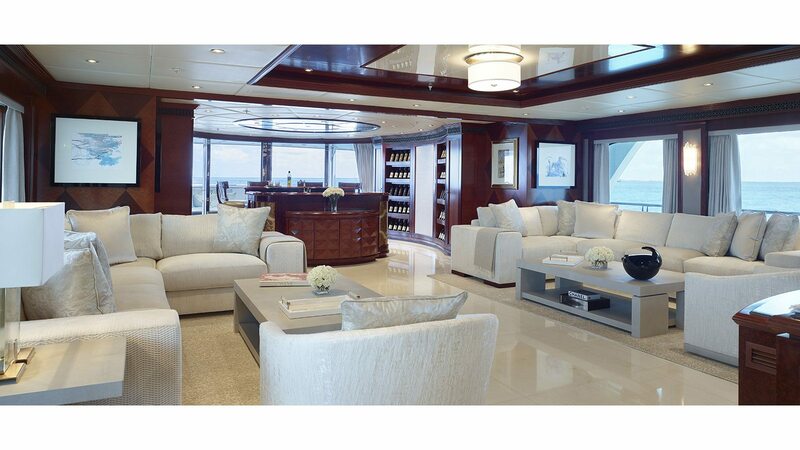 The sky lounge to the aft is the perfect place for an evening of entertaining, and there is a large bar to provide guests with plenty of drinks while dining at the oval table or unwinding on the extensive sofas arranged into an L-shape around the coffee tables and widescreen TV. On the sundeck, guests have the ultimate workout facility with a well-equipped port-side gym and a starboard sauna and steam room. 2 x Caterpillar 3516C HD engines each producing 3,384 HP will produce a cruising speed of 16 knots and a top speed of 18 knots with a range of 3,100 nautical miles at economical speed. The accommodation provides for up to 12 charter guests across 7 modern en-suite cabins: 1 Master suite, 1 VIP stateroom, 3 double cabins, 1 triple cabin with a Pullman berth and a convertible cabin beside the Master suite. 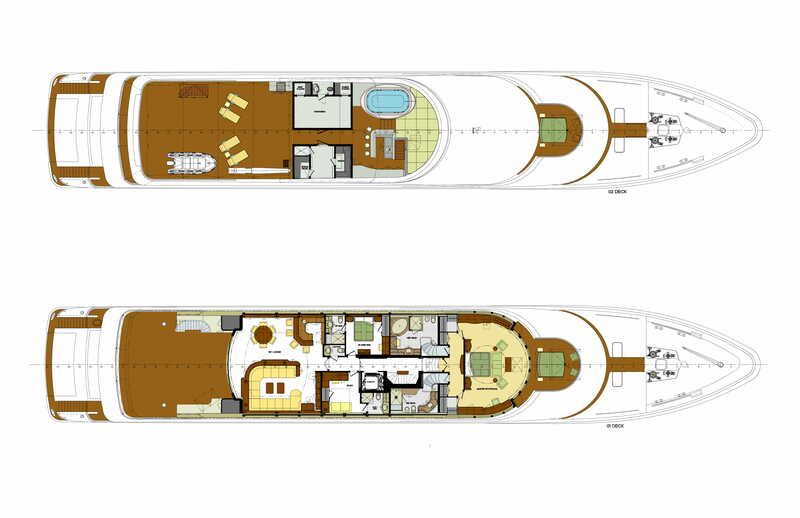 We do have available further amenity, owner and price information for the 60.34m (198') yacht 60M TRI-DECK SUPERYACHT, so please enquire for more information.